Last Monday, our theme for docent training was “a morning of architecture in Dallas.” I invited Katherine Seale, director of Preservation Dallas, to speak with the docents about the influence of the Arts and Crafts movement in Dallas. As director of Preservation Dallas, Katherine has firsthand knowledge of all the historic homes in Dallas. The Arts and Crafts movement hit Dallas later than on the East and West coasts, but there are many excellent examples of Stickley-esque Craftsman homes in East Dallas. Katherine spoke about Swiss Avenue and the Munger Place neighborhood, both of which I was familiar with already. To me, the most fascinating part of Katherine’s presentation was about a neighborhood in Oak Cliff called Winnetka Heights. 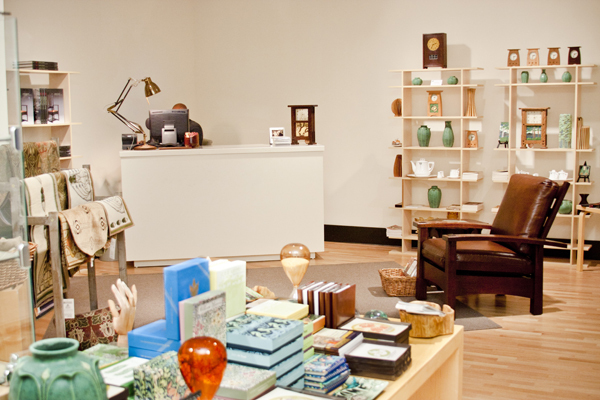 Winnetka Heights is, according to Katherine, the most Arts and Crafts neighborhood in Dallas. Craftsman bungalows–one-story homes made of wood with low-pitched roofs and exposed joinings– line the streets of this neighborhood. I’m already planning a weekend outing to view these homes. Following Katherine’s presentation, architect Ann Abernathy spoke about Frank Lloyd Wright in Dallas. Yes, the DMA currently has an exhibition of his prints: Line and Form: Frank Lloyd Wright and the Wasmuth Portfolio. But did you know that Wright was the architect for the Kalita Humphreys Theater? Ann is the perfect person to speak about Frank Lloyd Wright, because she was the project lead for the renovation of Wright’s Oak Park home and studio. She has also been named the project lead for the renovation of the Kalita Humphreys Theater. This gives her the unique distinction of having worked on projects that were created at the beginning and end of Wright’s career. The plan for the Kalita Humphreys Theater came from a 1914 theater plan that was designed by Wright but never built. When he was asked to design a building for the Dallas Theater Center, Wright agreed, but only if he could use his 1914 plan. What many people may not know is that the Kalita is one of the last buildings constructed by Wright–he began work on it in 1955 when he was eighty-eight years old, and it was completed after his death in 1959. 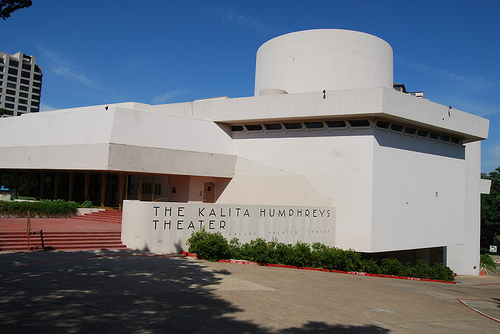 As anyone who has visited the Kalita Humphreys Theater knows, it is situated on a hillside over Turtle Creek. The building is constructed from reinforced concrete, and is considered to have wonderful acoustics. This comes from Wright’s own interest in the science and theory of acoustics. The theater also features a revolving stage. My favorite element of the theater is how the audience wraps around the stage. Every performance at the theater feels like an intimate gathering. Katherine and Ann’s presentations have opened my eyes to a new way of looking at buildings in Dallas. 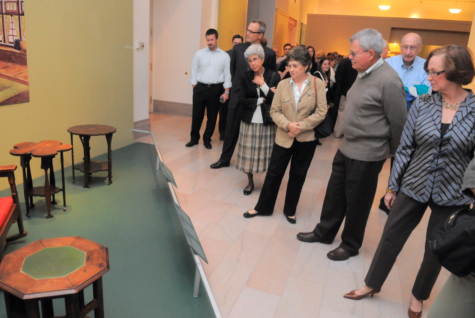 I encourage you to spend Mother’s Day weekend at the DMA to learn more about Wright and Stickley. 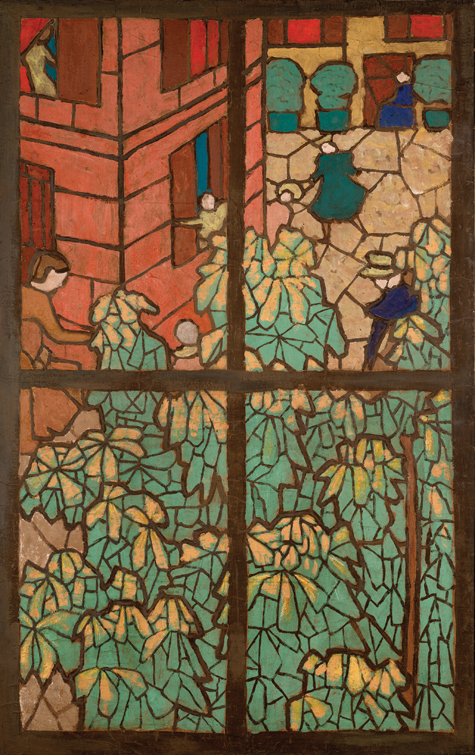 Examine the drawings in Line and Form: Frank Lloyd Wright and the Wasmuth Portfolio and spend time marvelling at the beauty of Craftsman designs during the closing weekend of Gustav Stickley and the American Arts and Crafts Movement. Hello, everyone! DMA resident exhibition designer Jessica Harden here to give you a short and sweet behind-the-scenes snapshot of where some of our inspiration for exhibition design comes from. 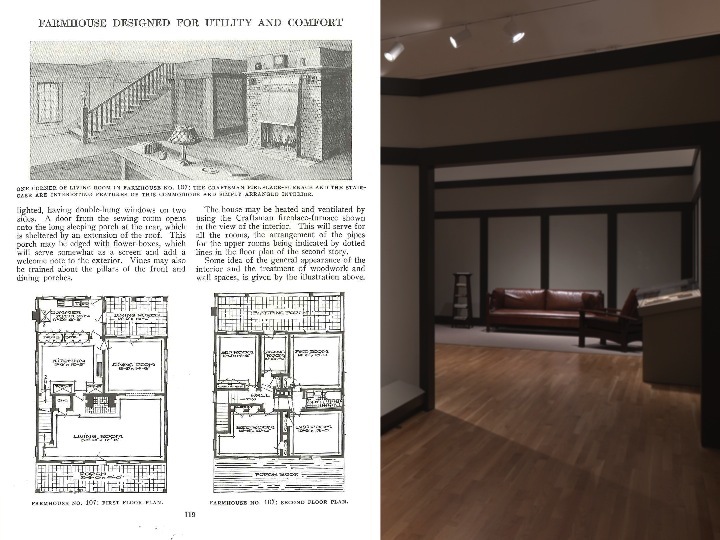 The Gustav Stickley exhibition was fun to work on because I had lots of great resources, including original photographs and The Craftsman catalogues, which Stickley published with drawings of many of his architectural and interior designs and finishes . . .
as well as records of popular colors of the time. 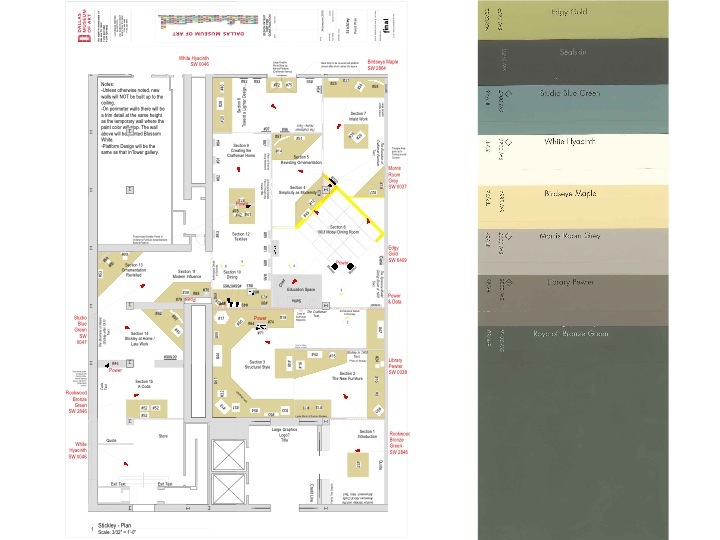 We chose paint colors for the exhibition based on the Sherwin-Williams Arts & Crafts palette. BTW, drawing up plans for the exhibition is also part of my job . 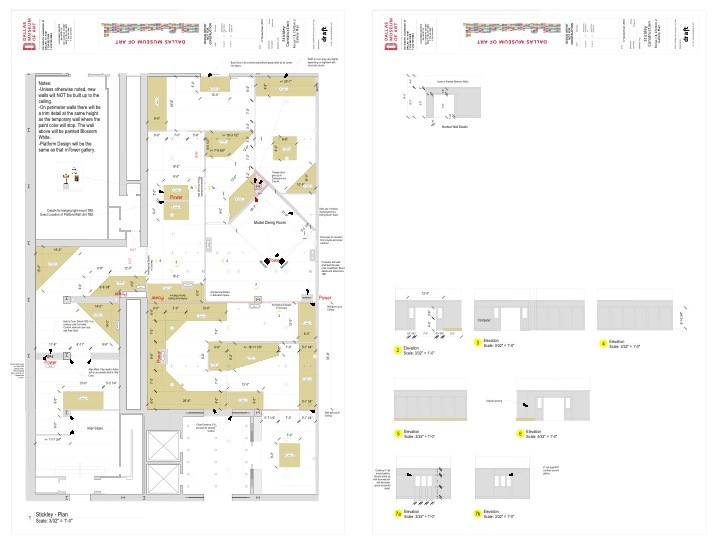 . .
as is producing construction drawings. 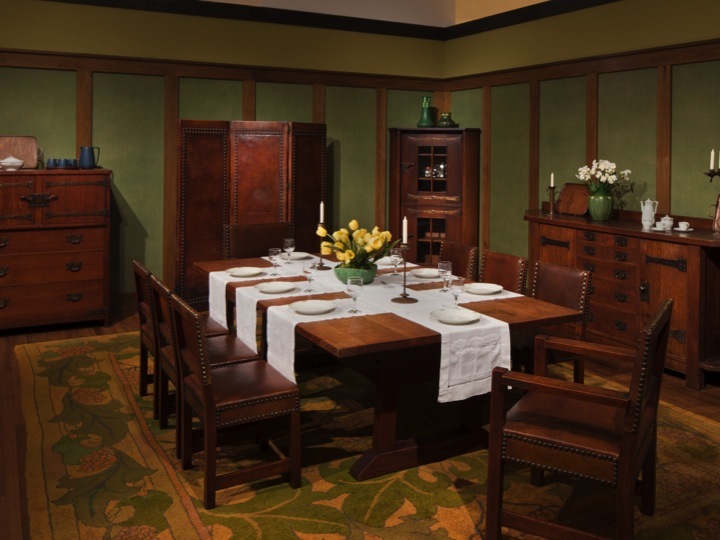 But back to inspiration and resources—this is a photograph of a model dining room created to show Stickley’s furniture in 1903.
. . . and this is our gallery at the DMA that we designed and built to replicate the original. 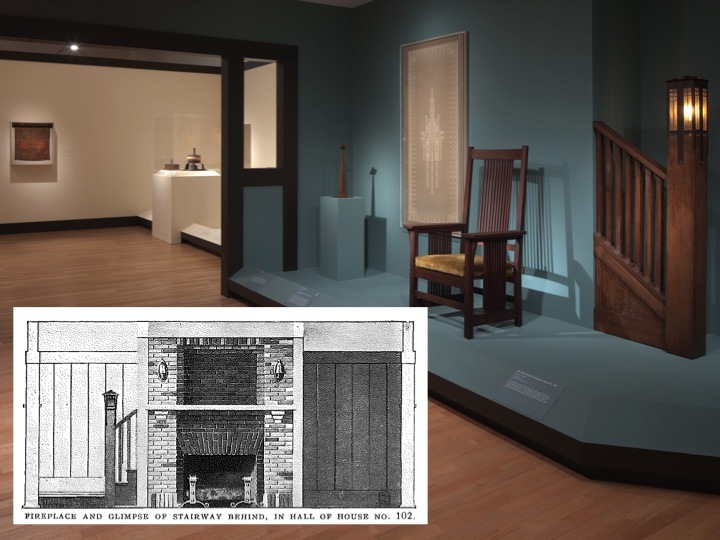 In fact, if you look around the Gustav Stickley exhibition galleries, you might notice a number of details that were inspired by Stickley’s original designs. Here, we were inspired by how Stickley used interior cut-outs to define spaces and create interesting thresholds to transition from one room to the next. We also took inspiration from Stickley’s use of simple trim work on walls to help us define spaces and create a more residential environment for the exhibition. This included using a cap rail to imply a lower ceiling height in our 14-foot-high exhibition galleries. And just to have a little fun, we took a few chances to let visitors discover glimpses of upcoming galleries and objects along the way. Even some of the smallest details of the exhibition were inspired by Stickley. Here you can see that the mount for this lamp was modeled after drawings from Stickley interiors and was fabricated by our extremely talented preparators and carpentry staff. They even made new heads for the screws to match the originals! Gustav Stickley and the American Arts & Crafts Movement is on view at the Dallas Museum of Art until May 8, when it will travel to San Diego to open on June 18. Jessica Harden is Exhibition Design Coordinator at the Dallas Museum of Art. 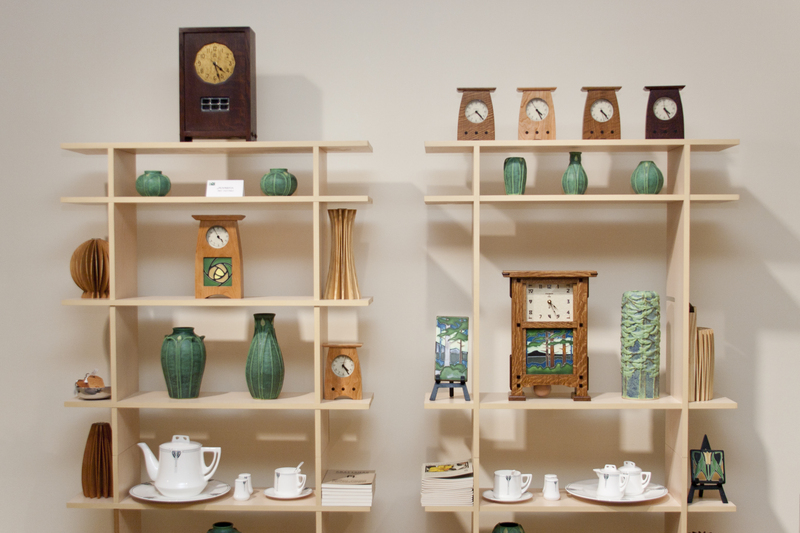 Take home a bit of Americana inspired by the age of Gustav Stickley in the exhibition store. Have you ever wished you could see what goes on behind closed doors at the Museum before an exhibition opens? Well, we want to bring you in on the action with a few scenes from the installation of the DMA-organized exhibition Gustav Stickley and the American Arts & Crafts Movement, which opens this Sunday. If you can’t wait until the February 13 to see more, you are in luck! 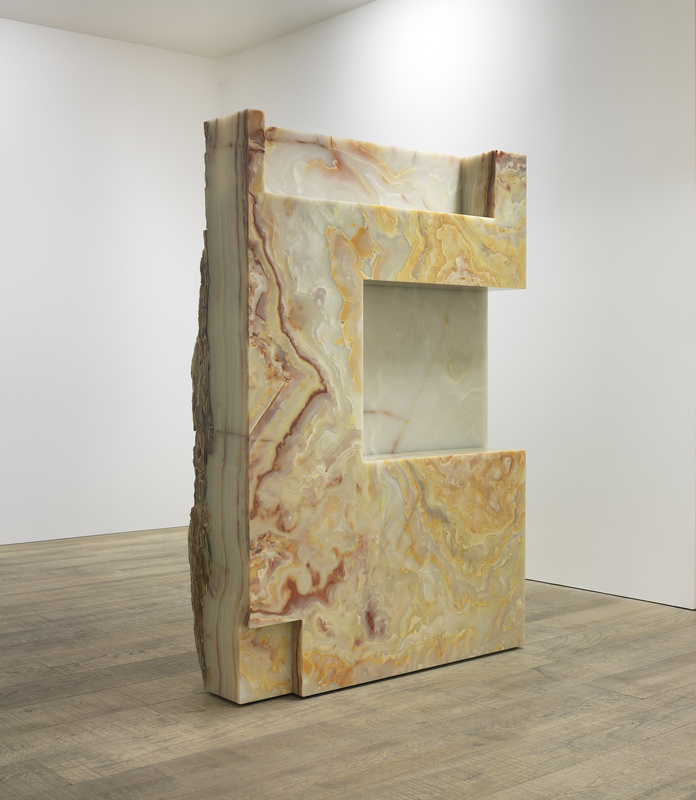 A FREE sneak peek of the exhibition begins at noon on Saturday. 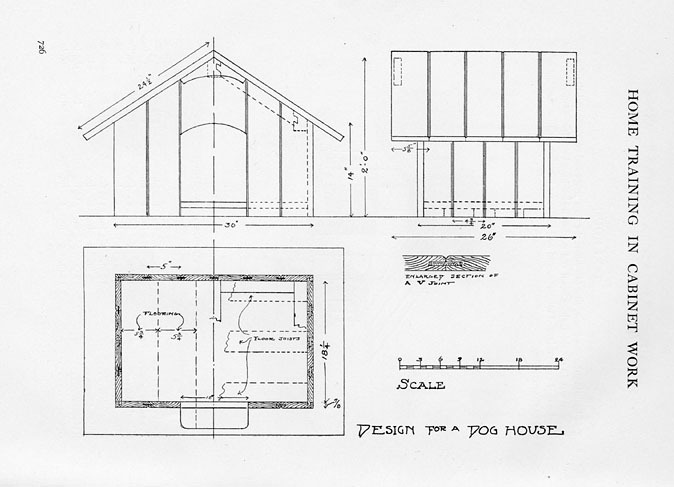 Early 20th-century designer and businessman Gustav Stickley believed in the do-it-yourself movement. 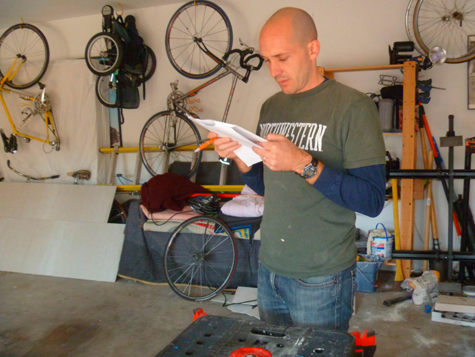 His magazine, The Craftsman, provided readers with step-by-step instructions on making household objects such as side tables, clocks, embroidered pillows, and even birdhouses. 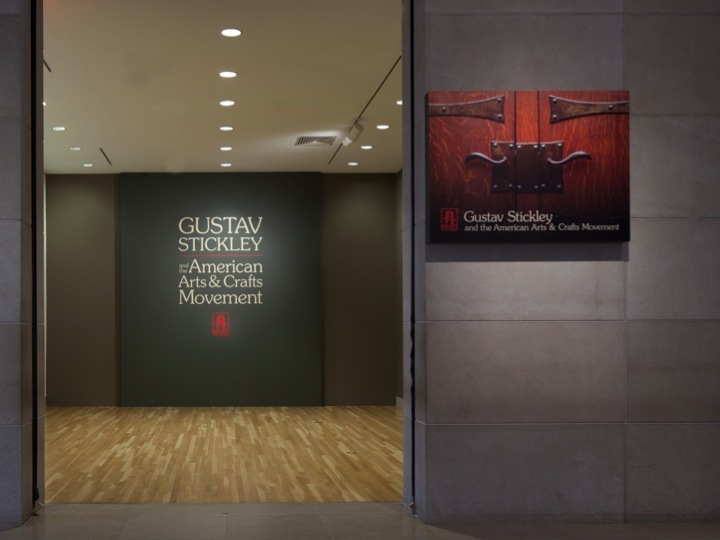 In just a few months, the Dallas Museum of Art will host the exhibition Gustav Stickley and the American Arts & Crafts Movement. 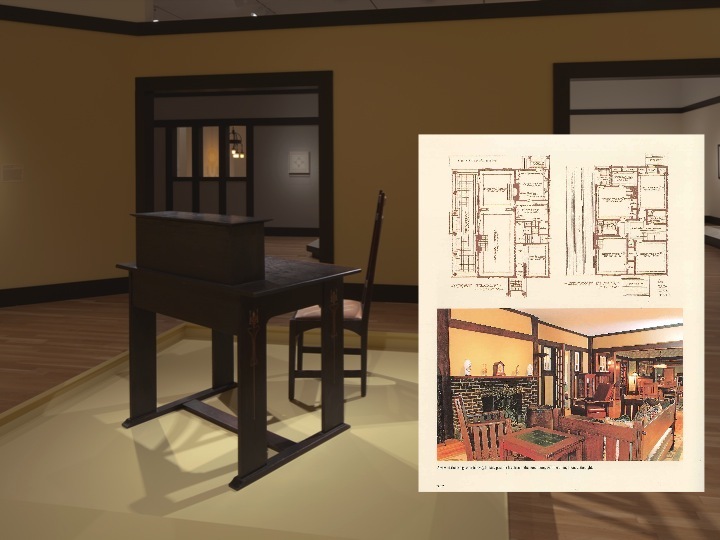 We’re inviting people to produce objects inspired by Stickley’s designs, document their process, and share their experience with the DMA. These videos and photographs will be displayed in the exhibition’s education space. Our deadline is January 5. 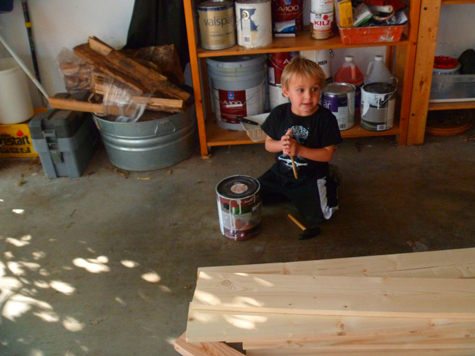 Learn more about the DIY Stickley project on the DMA website. 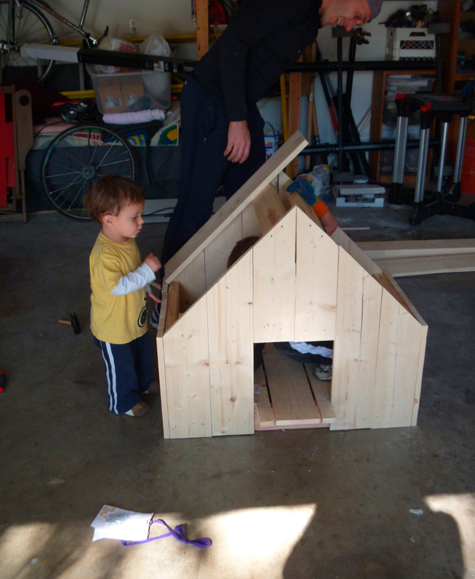 A few weeks ago, my husband, John, and I thought it would be fun to take up Stickley’s challenge and make one of his simpler designs with our kids, Aiden and Rowan. 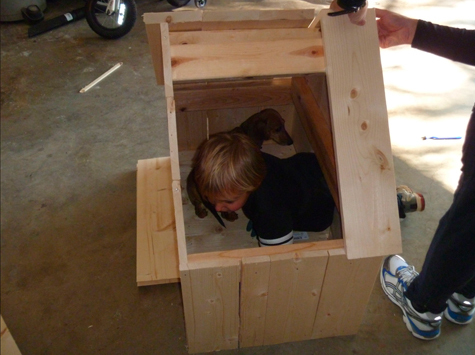 After some debate, we decided to make the doghouse for our two dogs, Sampson and Beasley. Building the structure moved along pretty quickly thanks to John and Aiden. 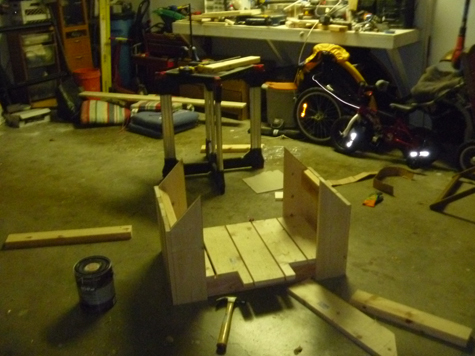 By the end of day one, we had framed the structure and attached the walls and floors. 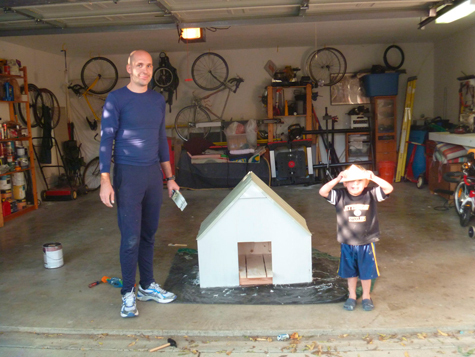 Day two included attaching the roof, painting, and trying to get the dogs to go inside the doghouse. 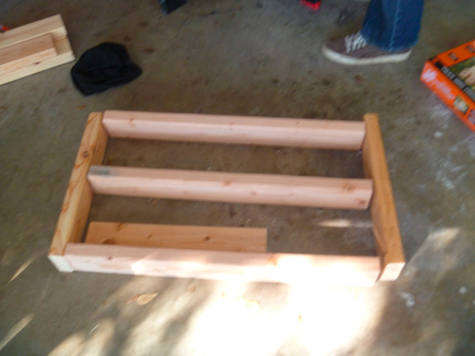 Apart from adjusting the measurements and the paint, we stayed close to Stickley’s original design. This was a fun weekend project for our family and a great way to make Stickley’s designs come to life in the 21st century. Gustav Stickley and the American Arts & Crafts Movement will be on view at the Dallas Museum of Art from February 13 through May 8, 2011. 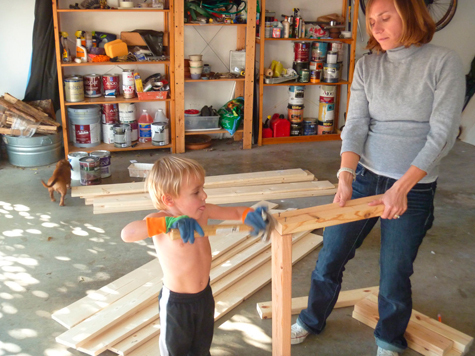 To learn more about the do-it-yourself Stickley project and discover how you can participate, visit the DMA website. Guest blogger Laura Bruck was formerly Manager of Gallery Interpretation at the Dallas Museum of Art and is currently an education consultant. There are few moments in a curator’s career more thrilling than the realization of a major exhibition project. While more modest exhibitions may take months of development, others require curators to commit years of their professional lives to researching the topic, seeking loans of works of art, and bringing together the necessary participants and funding to craft a touring exhibition and a substantial scholarly catalogue. Following my organization of the DMA’s last major decorative arts exhibition, Modernism in American Silver: 20th-Century Design, in 2005, I began work in earnest on a topic that I had considered years earlier, that of the work of one of the leading figures of the American Arts and Crafts movement, Gustav Stickley (1858-1942). 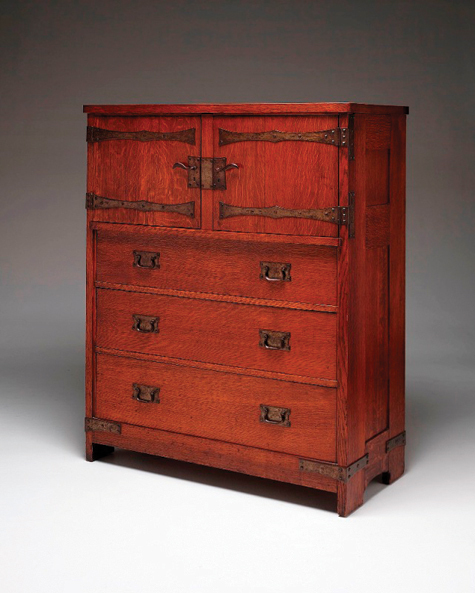 In recent decades, Stickley’s name had become nearly synonymous with the boldly functional Craftsman furniture more broadly known as “Mission furniture” (a term that he despised), and examples of his factory’s works had been included in major Arts and Crafts survey exhibitions in New York, Boston, Los Angeles, and elsewhere. Given this, I found it curious that no museum had yet undertaken a monographic study of Stickley’s production for a major touring exhibition. As I later discovered, some colleagues had pondered the topic but for various reasons were unable to pursue it. It was, for me, and for the DMA, an opportunity to forge another strong link between the Museum’s development of its 20th-century decorative arts and design collections and an exhibition idea that seemed to resonate with possibilities. Stickley, as an orchestrator of design and a proselytizer for the simple life – he even published a magazine, The Craftsman, to promote his progressive ideas – was far more than an owner of a furniture factory. In the first decade of the 20th century, he sought to change the way Americans thought about the home, machine-made goods, craft, and, ultimately, their lifestyle. 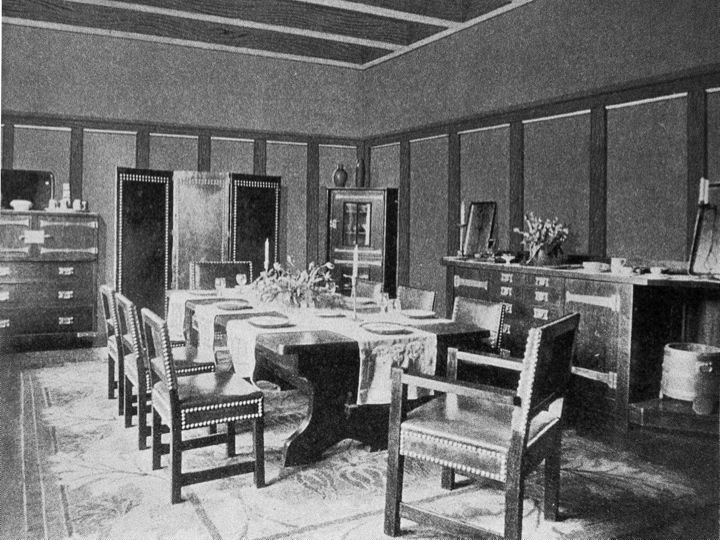 The subject was about not only furniture as design but the very art of how one could, or in Stickley’s mind, should, live. An appointment in Manhattan provided me with an opportunity to walk by Stickley’s Craftsman Building, which still stands right off of 5th Avenue and 38th Street (it’s now a restaurant and offices). 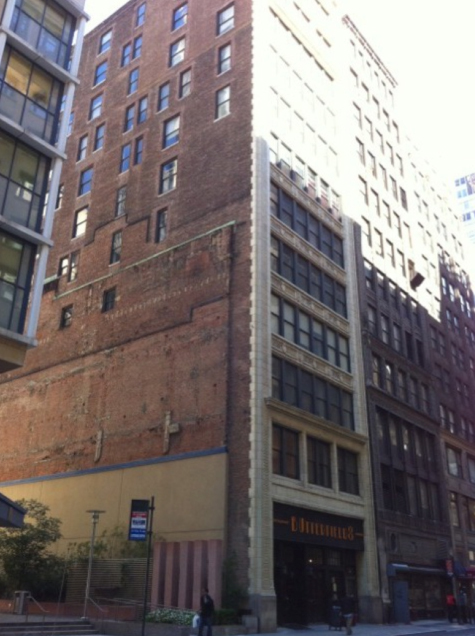 He leased the entire 12-story structure in 1913 and used it as a headquarters and a department store. Furniture, garden supplies, household equipment, rugs, and a host of goods were sold here; there was even a “Craftsman Restaurant” on the top floor. What exactly was in a Craftsman fruit cocktail anyway? 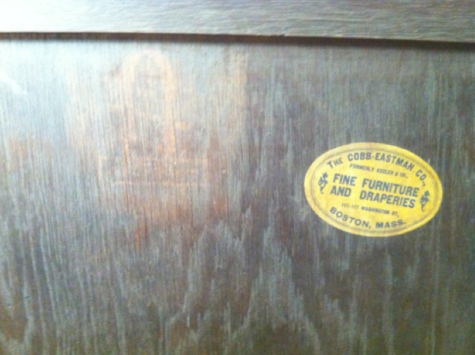 On the left, one can just barely make out the Stickley mark as a red decal on the back of this desk. A joiner’s compass (an archaic woodworker’s tool used to lay out circles) surrounds his borrowed motto “Als ik kan” (If I can) and below is a copy of his signature. While subtle differences in this mark can tell us what year this piece may have been made (this work is from 1903 or 1904), the paper label to the right is especially interesting to me – it indicates where the piece was originally sold. Surviving retailer tags such as this one are far rarer than Stickley’s own mark. 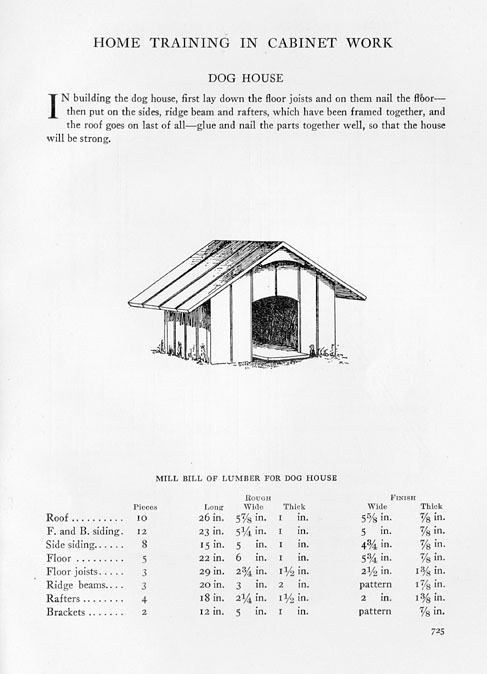 Dallas had two retailers of Gustav Stickley’s Craftsman furniture between 1902 and 1916. 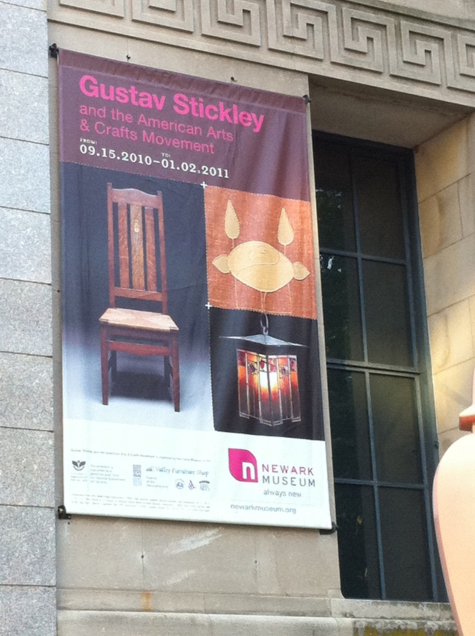 Five years later, on September 15, 2010, we celebrated the public opening of the exhibition Gustav Stickley and the American Arts & Crafts Movement at the Newark Museum. Although it is unusual to premiere an exhibition at a museum other than the organizing one, there was a happy synchronicity in that Craftsman Farms, once Stickley’s New Jersey home (and located a mere twenty minutes from Newark), is celebrating their centenary. The night before the public opening, lenders, colleagues, museum members, press, and other guests convened at the museum for the usual slate of honorific speeches, convivial chats, and a sneak peek at what would be revealed when the doors officially opened the following day. 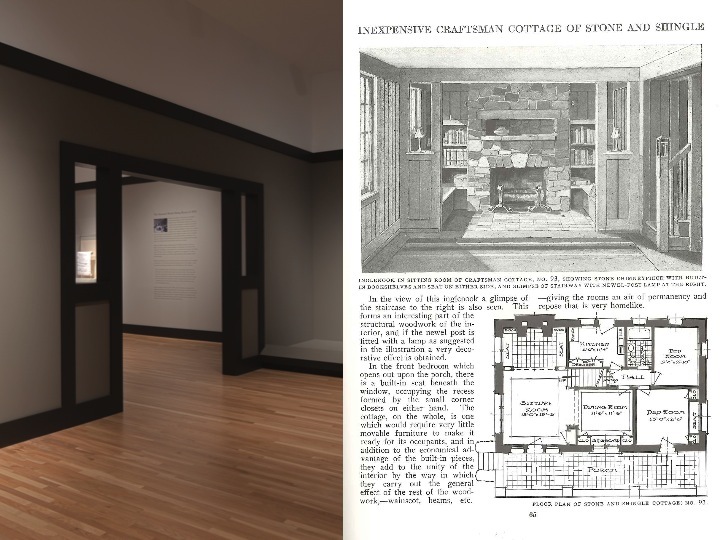 Arriving at this point required hundreds of hours of research into Stickley’s career, pouring over surviving business papers at Winterthur, examining original sales catalogues, advertisements, photographs, inventories, and other documents, and, with this information in mind, reviewing the actual pieces of furniture, metalware, textiles, and architectural drawings that are included in the exhibition. This research is the very heart of such exhibitions and associated catalogues and not only allows us to satisfy our curiosity as scholars – the why, when, and how these works were made and for whom – but also provides us with the knowledge for shaping a new and compelling story for our visitors and readers. The Newark Museum’s staff never slowed down for a moment – preparing for an opening, especially one with large pieces of furniture and a recreation of an entire dining room, is not a simple matter. Each work must be handled with care, its condition well documented, labels written by the curator and placed by the preparation staff. That’s the condensed version. 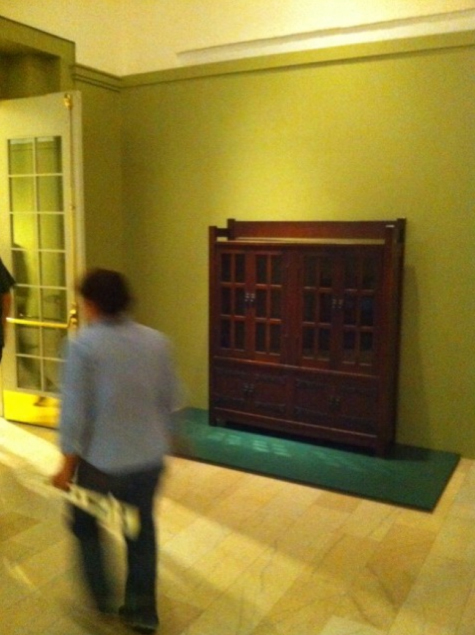 One of Stickley’s rectilinear oak bookcases from 1901 looms in the background, awaiting its public premiere. 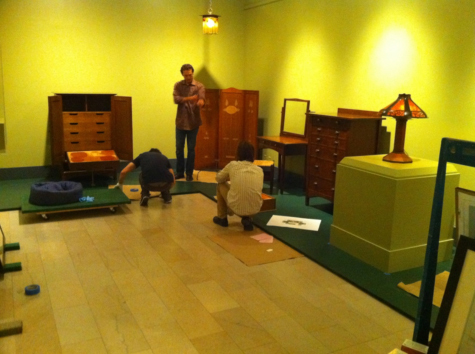 DMA registrar Brent Mitchell consults with Newark’s team as we prepare to install Stickley’s own chest of drawers (far left). The best laid plans must always be adjusted to accommodate those unexpected challenges. 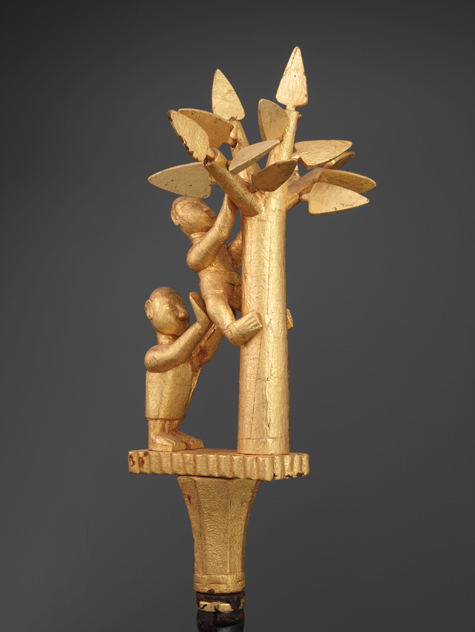 After spending nearly two weeks supervising the installation of the exhibition with DMA registrar Brent Mitchell and the dedicated staff at the Newark Museum, including Ulysses Dietz, their curator of decorative arts, I at last felt a sense of relief and exhilaration as the last object was placed. 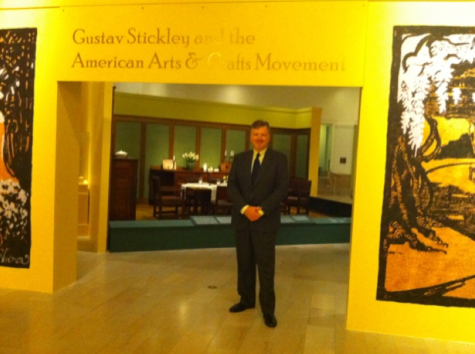 The exhibition is done, at least for now – come February 13, 2011, the doors will open to the DMA’s presentation of Gustav Stickley and the American Arts & Crafts Movement. Kevin W. Tucker is the The Margot B. Perot Curator of Decorative Arts and Design at the Dallas Museum of Art.